Effectively cleans activewear and eliminates residues from your footwear. 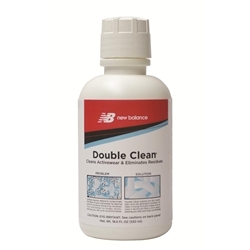 •Double Clean washes out dirt, sweat, odor and old detergent residues. •Clean-rinsing formula makes activewear's technical fibers work again, keeping you drier and more comfortable. •Contains no phosphates, fragrances, colorant, enzymes, softeners, bluing/fluorescent whitening agents or UV brighteners. Double Clean is formulated WITHOUT harsh chemicals, phosphates or fragrances that clog the pores and reduce the performance of expensive active wear garments. Ordinary laundry detergents leave behind residues that paste the garment fibers together leaving clothing feeling stiff and scratchy. Double Clean leaves no residues behind so your clothes are soft, requiring no fabric softeners or additional chemicals. Because no residues remain after washing in Double Clean, there are no substances to cause rashes, redness, itchiness, irritable skin or allergic reactions. Double Clean is biodegradable and will not affect the flame resistance of children's sleepwear. In other words, it's great for the whole family.